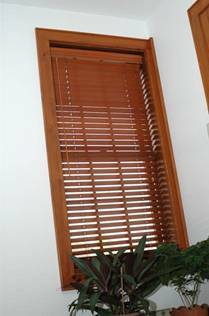 This set of hardwood blinds was selected with the help of samples sent at no charge from the web site dealer. They fit perfectly. I bought my first batch of window blinds from a big-name franchise more than 10 years ago. The experience left me with the same feeling I got after wandering into the back alley of a Jamaican street market, where I met a loud huckster extremely eager to sell me a hand-carved mahogany horse. My visit to the blinds store began with a price quote that seemed outrageous and I said so. "But," as I was quickly informed by the smiling salesman, "this is your lucky day, Mr. Maxwell. My manager is about to submit a large order. If you give me your credit card within the next 20 minutes, we'll knock off 20 per cent." A few minutes later – the price still seeming too high – the guy returned. "Mr. Maxwell! Good news! We just took a call from a big-name designer here in the city. If you say yes to your blinds order within the next 15 minutes, we can piggyback your blinds with his and discount your price by an additional 30 per cent!" It felt like I'd fallen into a real life infomercial. All that remained was the offer to throw in that amazing bread knife that cuts steel. In the end, I went for the blinds, but not because I thought it really was my lucky day. The ruse was thin, I felt manipulated, and I couldn't help wondering how many folks ended up paying way too much for blinds this way. Maybe even I paid too much, despite all my "luck." But as I’ve discovered, you don’t have to play games when buying blinds. You don’t even need to leave the comfort of your home. When it came time to buy more blinds for my place this past summer, I logged onto the Internet to check out the selection. Buying blinds is complicated, so I didn’t expect to be able to actually complete my purchase while sitting on a lawn chair with my laptop. But I was wrong, even down to the issue of actually seeing samples in person before settling on a deal. The outfit I ended up buying from was www.selectblindscanada.ca. And while there may be other online blinds vendors that are as good, I couldn’t find them. Their selection was excellent, the blinds fit my windows perfectly, and installation took me five minutes per blind. I even got an unsolicited email from a real live person updating me on the status of my order in transit. If I lived next to a blinds store, I’d still purchase on the web this way. The whole process took about 20 hassle-free minutes at the keyboard. Selling blinds online isn’t easy. There are lots of variables: dozens of possible styles, the need for custom blind widths on every order, and the challenge of communicating to customers exactly what different colours and styles actually look like in real life. Whoever’s behind Select Blinds has addressed all these issues in a way that I can’t criticize. I wish I could find some fault with the buying experience, if only to make the account of my experience seem more authentic. There’s a moment in every discretionary purchase when the deal clicks in your mind, when you commit internally to saying ‘yes’. But when it comes to something as personal as blinds, I doubt the click would have happened for me if it weren’t for one big, difficult to provide thing: the opportunity to see physical samples of the styles and colours that struck my fancy online. Select all the colours you want on the website, fill in your physical address, then a week later a thick envelope arrives in the mail. It contains a personalized sheet of paper with 60mm lengths of all the blinds you’ve sampled, glued to a piece of paper with your name on top, delivered at no charge. I had trouble deciding between less expensive faux wood and premium real wood horizontal blinds. The sample sheet solved this problem for me instantly. It also allowed me to correct a mistaken choice I would have made by selecting colours based on my computer screen only. More and more of my home improvement purchases are either being made on line, or heavily influenced by what I learn there. I know I’m not alone, and that’s a good thing. Online purchasing dispels retailer nonsense because comparison shopping is just a click away. It keeps more of us off the road, out of over-stuffed parking lots, and free from silly in-store gimmicks. And wouldn’t you know! The cost of my online blinds was less than that amazing deal I lucked into ten years ago. - Steve Maxwell is technical editor of Canadian Home Workshop magazine.